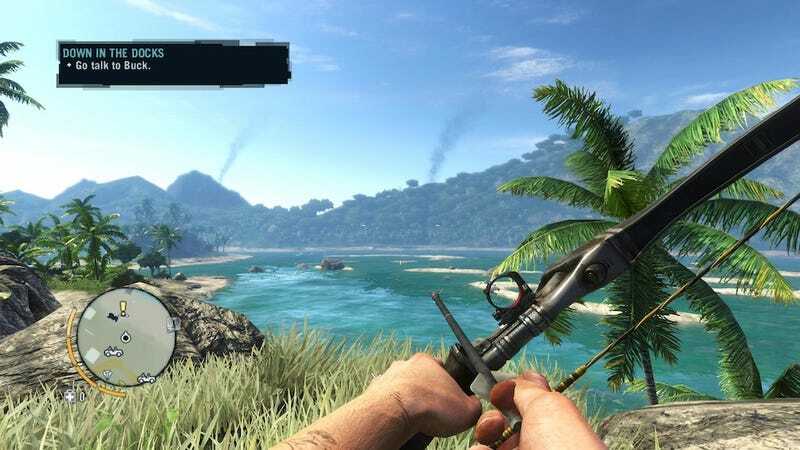 And the tigers wept, and the tapirs sang: Ubisoft has confirmed that they're working on a patch for Far Cry 3 that will let players adjust or remove the game's clutter-y user interface. Far Cry 3 is a lot of fun, but the screen-clutter kind of a mess, particularly if you're pretty good at the game and don't want to be told what to do all the time. Unfortunately, the game didn't ship with any way to turn that mess off—most players would just have to be content with constant notifications popping up every few minutes. This week, some folks came up with a way to hack the PC version so that the HUD vanishes entirely. (The HUD-free screen up top is from my game with that tweak active.) I like playing that way, but it does come with its share of annoyances. A more preferable solution would be if Ubisoft let us choose how much or little of the UI we wanted to see. Sounds like they're giving us exactly that. There's no ETA on the patch, but hopefully it'll be out in time for most players' second go-round.